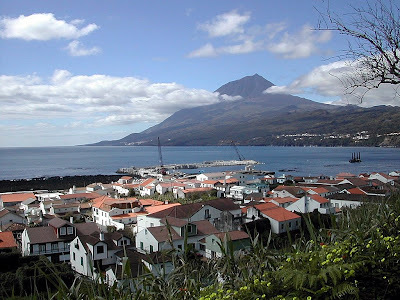 Lajes, on the south coast of Pico, is a sleepy little village. The main street, which runs north to south, is rarely packed with shoppers, and the mother church, as the main religious building in each Azorean settlement is known, looks disproportionately large for the needs of what must be a small and dwindling population. But along the seafront are two reminders that this was once one of the most important places on the island. The concrete and marble structure at the end of the quay is the whaling monument; three interconnecting boat houses on Rua dos Baleeiros now house the whaling museum. Apart from the signs advertising whale-watching trips from the village, these are the only indications that Lajes was once the centre of an industry that flourished in the Azores, and mainly here on the island of Pico, for more than two centuries, until the late 1980s. Whaling was introduced to the Azores by whalers from the east coast of the United States, who arrived in the islands during the 18th century, driven further and further south by a decline in the numbers of sperm whale to be found closer to their own shores. They stopped in the Azores in search of supplies and human reinforcements, and a logistical support industry grew up around the harbour of Horta, on Faial. But the local fishermen quickly realised that there was money to be made in hunting large cetaceans and an Azorean whaling industry began to flourish, based on the islands of Flores, Faial and, particularly, Pico. The whale first had to be identified from the shore by keen-sighted whale-spotters who kept watch from huts, or "vigias", on the cliff-tops. Many of these structures can still be seen around the islands. These men would send up flares to alert the whalers that they needed to get ready to go to sea. The boats set out in pairs, and once boat and whale were alongside each other, the whalers harnessed them together by spearing the creature with an eight-foot harpoon, and then killing it with a lance which pierced its heart. After the whales had been brought ashore, they were cut open and taken to a nearby factory for processing. One of these was at São Roque do Pico, on the north coast of the island, which has now been turned into a Whaling Industry Museum. The tanks on display here were once used to melt the blubber - an unappetisingly smelly procedure - and to turn it into sperm oil, a valuable commodity which could be used in cosmetics, lubricants, paints, wax and many other products. This was the most useful part of the whale, but nothing was wasted. The meat was ground and the bones crushed to make animal feed and fertilisers and the liver was ground to produce an oil rich in vitamins A and D.
The sight of the old ship on display in the island's other whaling museum, back in Lajes, highlights the dangers that the whalers were subjected to in order to bring these vast creatures ashore. It seems remarkably small, given the strength of the ocean and the size of the whales that it went out to pursue. Open boats like this one offered little protection from the either the weather or the whale itself, although they continued to be used in Pico longer than anywhere else. Whaling was finally abandoned around the islands some 20 years ago and the whalers were forced to look elsewhere for work. But whales continue to provide the Azores with some of their income. Whale-watching has become a popular activity, with trips available on a daily basis from several of the islands during the summer months. A three-hour trip from Lajes with Futurismo on Avenida Marginal (00 351 292 672 000) will cost €45 (£32). There is a full refund if no whales are sighted, although this rarely happens. The company sends whale-spotters to the old look-out posts on the cliff-tops, but these days when they see a whale they communicate direct with the boat by radio instead of sending up a flare. These trips take place from April to October, although the company also operates year-round trips from Ponta Delgada (00 351 296 628 522). Companies that operate from Horta include Norberto, based at Rua do Paiol 12 (00 351 292 293 891; www.norbertodiver.com). One aspect of the ancient whaling tradition still persists in the Azores. Scrimshaw is the art of engraving whales' teeth with intricate carvings. Its origins were prosaic. Cutting patterns into teeth pulled from captive whales kept bored whalers occupied while they were at sea. But much of the work that they produced has lasted, and there are displays in the gallery above Peter's Café Sport on the harbour at Horta on Faial and in the Whalers Museum at Lajes do Pico. The original technique was simple. Once a design - often a scene depicting the harpooning of the whale - had been scratched into the ivory it was rubbed with lamp-black to bring out the detail. The process eventually became mechanised and, now that whales are no longer hunted, the art of scrimshaw is gradually dying out. But there are still some scrimshaw artists at work, like John van Opstal, a Dutchman who has made the Azores his adopted home. He welcomes all visitors to his studio at Banda da Vila 17c, in Conceição, on the road that heads north just above Horta (00 351 292 392 720). The Whalers' Museum (Museu dos Baleeiros) at Rua dos Baleeiros 13, Lajes do Pico (00 351 292 672 276) opens 9am-12.30pm and 2-5.30pm Tuesday to Friday, 2-5.30pm at weekends. Entrance costs €1.25 (90p). The Whaling Industry Museum (Museu da Industria Baleeira) at Rua do Poço, São Roque (00 351 292 622 147) opens 9am-12.30pm and 2-5.30pm Tuesday to Friday, 9am-12.30pm at weekends. Entrance is free.